Product #45909 | SKU XD72ND16 | 0.0 (no ratings yet) Thanks for your rating! 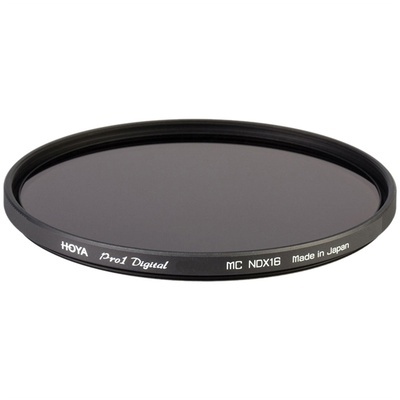 The Hoya Pro 1D 16x (4-stop) Neutral Density Filter has several uses and offers the possibility to achieve otherwise unachievable results. ND filters appear gray and reduce the amount of light reaching the film. They have no effect on colour balance. Neutral Density filters enable the shooter to adjust exposure without affecting colour balance. ND filters appear gray and reduce the amount of light reaching the film. Neutral density filters are available in 1, 2, 3, or 4 stops to suit individual situations. Determining which neutral density filter yields ideal results for any given lighting situation takes knowledge, experience, and a collection of such filters. Speaking generally, the 2-stop value (ND 0.6) effectively compensates average situations. Hoya's digitally multi-coated glass greatly reduces the appearance of lens flare and ghosting caused by reflections. The filter frame is made from a black matte aluminium satin finish almite frame which reduces reflections. Almite is a coating used to help prevent corrosion. The black rimmed glass contained in the filter reduces the chance of light reflecting off the edge. As a real benefit, each filter has a knurled edge to facilitate easy attachment and removal. Hoya has even included a UV protected plastic storage case to extend the life of the filter. In addition, the Pro 1D filter is a low profile (thin) design making it a great choice for the wide angle shooting common in today's photo and video market. The advantage of most Hoya filters is that Hoya puts, at least, one layer of anti-reflective coating on each side of their glass. It is not bare glass. Even if the glass is not multi-coated, this kind of production tends to minimise flare and ghosting.